We had two different duck breeds show up after the snow on Sunday night. I saw them earlier this Spring but they were too far away to get a photo. 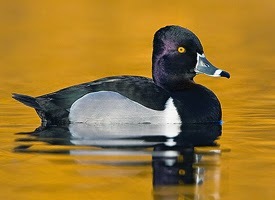 One was a Northern Shoveler and the other a Ring-necked Duck. Each are very pretty ducks. We have another breed out there today but I haven't identified it yet. The pair on the right are a male and female Northern Shoveler and the others are Ring-necked Ducks. 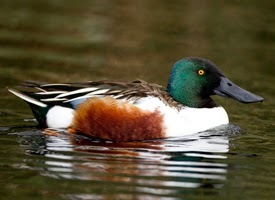 Male Northern Shoveler photo came from the Cornell Lab site. These are the Northern Shoveler ducks. Notice the wider bill which looks like a shovel. I took a video of the ducks. I need some practice with videos. My jerky motions have to be controlled better, and the sound is so sensitive that any little sound is heard. I also should be editing out some of the video with much nothing going on. Hopefully my next video will turn out better. In addition to the ducks, more birds are returning to their springtime stomping ground. This is a Rufous-sided Towhee. And then there is the Mourning Dove. They stay all winter but must also think it is time for Spring. This one has some nesting material in it's beak and is getting ready to build a nest.